One of India's biggest and most popular movie stars, Salman Khan, was sentenced to five years in jail Wednesday on charges of driving a vehicle over five men sleeping on a sidewalk and killing one in a hit-and-run case that has dragged for more than 12 years. Judge D. W. Deshpande of the Mumbai Sessions court found Khan guilty earlier Wednesday of culpable homicide. The 49-year-old actor was also given separate terms for negligent driving and causing grievous harm to the victims, but all the sentences will run concurrently, defense lawyers said. Khan is one of Bollywood's most popular stars, appearing in more than 90 Hindi-language films in his 27-year career. His lawyers filed an appeal for bail in the Mumbai High Court, lawyer Srikant Shivade said. It granted Khan two days of temporary bail until it hears his formal bail plea on Friday. If bail is approved, Khan will not have to go to jail while he appeals Wednesday's verdict. Most Indian prisons are overcrowded and have poor sanitation and health care. However, a high-profile prisoner such as Khan is unlikely to be kept with hardened criminals and would probably be accommodated with white-collar offenders. The prosecution told the court that Khan was drunk when he rammed his SUV into a group of homeless people sleeping on a sidewalk in September 2002. Khan has all along denied that he was behind the wheel. In April, his driver Ashok Singh told the court that he was driving and lost control of the SUV when one of its tires burst. But Judge Deshpande dismissed the actor's claim and accused him of driving the car under the influence of alcohol and then fleeing. Khan also faces trial in a separate case for allegedly killing two rare deer in a western India wildlife preserve 16 years ago. Huge crowds gathered outside Khan's house in south Mumbai on Wednesday for a glimpse of the star as he emerged from his apartment building surrounded by security guards. Scores of television crews and reporters followed the actor's car and thronged the court building as the judges gave their verdict in a case that has been closely watched by millions of Khan's fans in India and abroad. Television channels said Khan looked downcast during the court proceedings and teared up when the judge pronounced the verdict. 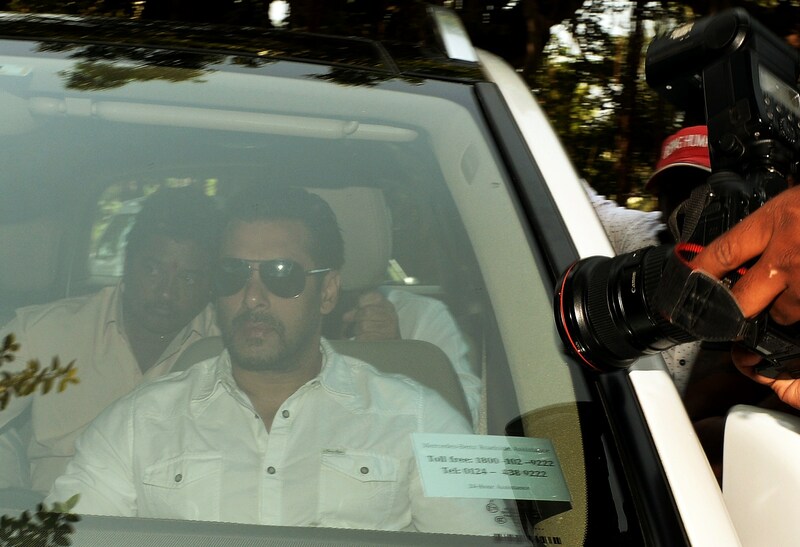 Khan's brothers, Arbaaz and Sohail, were present in the courtroom, which was packed with other relatives and Khan's friends from the film industry. Another popular Bollywood actor, Sanjay Dutt, is currently serving time for illegal possession of weapons linked to a 1993 terror attack in Mumbai. However, since he was sentenced in April 2013, Dutt has spent long periods at his Mumbai home on medical grounds. Khan began his career in 1988, playing a romantic action hero with many of his movies becoming box office hits. In recent years he turned to philanthropy, establishing a charitable trust called "Being Human" which works in education and health care for the poor. Bollywood filmmakers were worried about the court case because Khan has several films in the pipeline. Film industry analysts said Khan had projects worth 2.5 billion rupees ($40 million) depending on him. It could take years more for Khan's case to wind its way through India's overburdened legal system. The system is plagued by a shortfall of judges, corruption, police delays and excruciating layers of paperwork.